Beth Nydick, Holistic Health Coach, invited us to guest post on her blog at Blue Barn Kitchen and we thought it would be fun to share a healthy recipe with her readers as well as share a sneak peak into who we are and what we do. Below is our post, but definitely head on over to visit her site! Lots of resources there on healthy eating! Today we thought it would be fun to give you a little sneak peak into a shooting day with us so you can learn a bit about our process and how we make our images. There's so much more than pointing the camera and shooting! So, here’s what we do to make food look it’s best. Our first step is to gather some inspiration images to get ideas on the look and feel we are going for with the day’s shoot. From there we can plan what backdrops and surfaces we’ll use, how we plan to light it, and what props to bring out. Usually Sue decides on the recipe and how to style the food and I decide how it is going to be shot and lit- will it be shot overhead? Straight-on from the side? A three-quarter angle? And where will the lighting be coming in from? Is this mimicking early morning? Mid-day? Early evening? Once those decisions are made, we’re ready to shoot. For this smoothie, we knew wanted to make it look bright and cheerful- so the idea was a light and bright photo shoot (as opposed to a dark and moody one, which might be more suitable for a winter soup, but eh hem, I’ve had one too many of those this month and we want some sunshine!) Because of this, we chose to shoot on a white marble surface to make the color of the smoothie really pop. 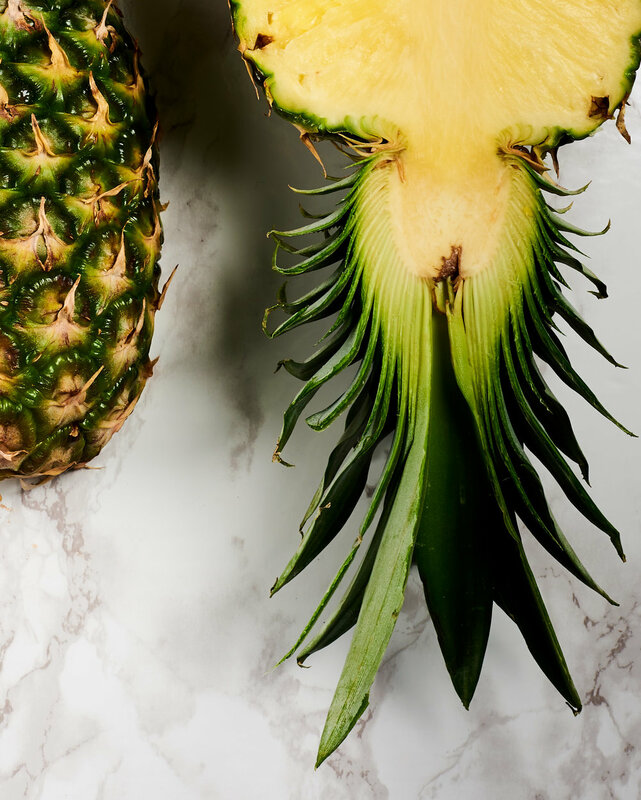 We also wanted to highlight some of the great healthy ingredients in the smoothie, since once they are blended you will not be able to see what’s inside. 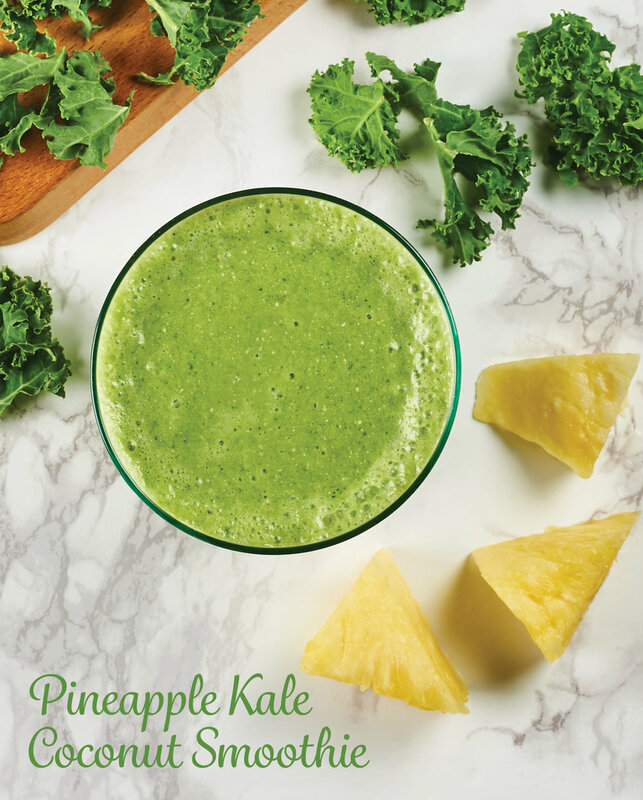 So we decided to surround it with big chunks of the pineapple and kale. 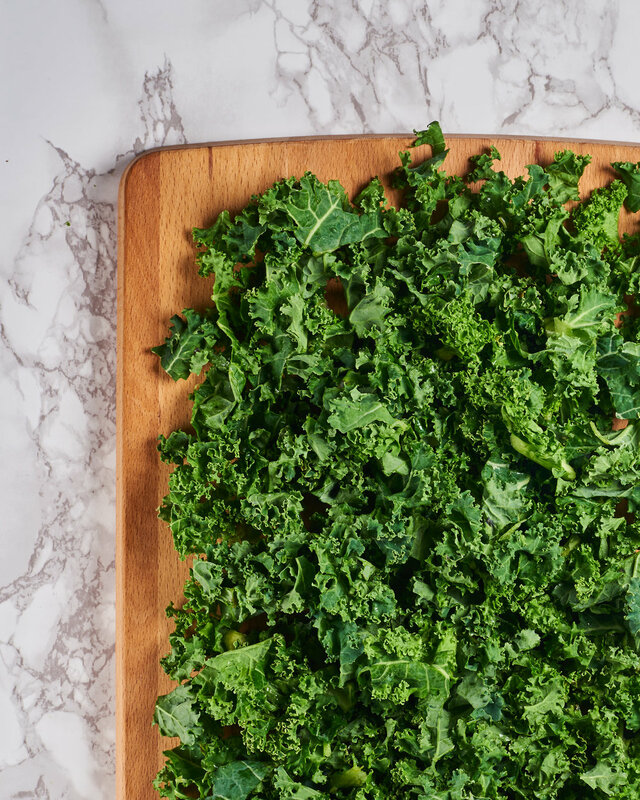 A word of advice when shooting food- don’t just run to the store and choose the first kale bunch you see! Food stylists take their time really looking at which ones look the freshest and buy those. You may get some weird looks from the produce department, but no worries, I think secretly they love that you are showing the care those vegetables deserve! We now have to set up our set. We get our backgrounds and surfaces in place, our props and glassware ready, but, we don’t put the food in yet! We use a stand-in (maybe it’s a rolled up towel or something like that to hold its place) because here’s the thing: food starts to wilt, discolor, and settle while onset. I happen to have LED lights so they are not hot, but even still, you’ve seen food after it sits awhile- it turns color, develops a crust, loses it’s effervescence, etc. So, once all these things are in place, we do some test shots to set up our lighting the way we want it. We then make sure the props are in a pleasing composition and our colors are showing appropriately on camera, and that I have a good white balance since those whites need to be actually white! Hope you enjoyed hearing about our process. If you are curious to know more, we’d love to hear from you! Drop us an email or give us a call. We welcome any conversations about food, and if we can help you make your food shine, let us know! In a high-speed blender, add ingredients in order. Blend until smooth. Add small amounts of water, if necessary. Enjoy!